I'll confess: I had little interest in trying the Arquiste line when it was first announced. Another day, another high-priced niche line with exclusive distribution, historical-geographical references, and minimalist bottles; right? But my curiosity was piqued by Kevin's review of Flor y Canto and Anima Dulcis, so I sniffed one or two selections during a visit to Barneys; and then I noticed that the newest addition to the line, Aleksandr, was a tribute to the Russian poet Alexander Pushkin. I have fond memories of reading and re-reading Pushkin's verse-novel Eugene Onegin at one point in my overly prolonged years of education, so I needed to give this fragrance a closer look. Aleksandr was developed with perfumer Yann Vasnier and includes notes of neroli, violet leaf, fir balsam, Russian leather, and ambrette. It is designed to tell the story of the last day of Pushkin's life, when the famed writer was mortally wounded in a duel in 1837. The neroli and violet are meant to evoke the hero's morning toilette, the leather to refer to his gloves and boots, and the fir balsam to evoke the winter landscape around St. Petersburg. I occasionally get irritable when I see literary or cultural references haphazardly grafted onto a fragrance that doesn't deliver on its promise (can you recall any recent example? ), but in Aleksandr's case, the story is seamlessly joined to the scent. Aleksandr opens with the sort of classical violet note that makes me sigh with delight. (I also enjoy this reminder that men commonly wore violet fragrance in the nineteenth century.) It doesn't dominate for very long, but the olfactory narrative continues to unfold smoothly: there's the neroli that might have scented our hero's gloves, and the smooth, fine leather of the gloves themselves. There's a breath of chilly air, with snow in the forecast, and the resiny darkness of fir needles on trees and underfoot. The neroli reappears later in the fragrance's development (would the duelers remove their scented gloves in order to shoot? ), adding lightness to the base of balsam and leather and subtle amber. There may even be a trace of gun-smoke emerging from the resins, or perhaps I'm just very suggestible. To summarize, Aleksandr is a dry, elegant composition. It's well-mannered but not dull, and it could be worn by men or by women who enjoy some (but not too much!) leather in their fragrance. I don't usually wear leather-based compositions, but I'm learning that I do enjoy a refined leather accord when it appears in the company of a floral note or two. (L'Artisan Parfumeur's Traversée du Bosphore is another case.) Aleksandr has good tenacity and moderate sillage, and it feels appropriate for a wintry day, worn with a long coat and high boots and a fur scarf. Leave the pistols at home, though. 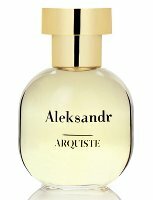 Arquiste Aleksandre is available as 55 ml Eau de Parfum ($165). For purchasing information, see the listing for Arquiste under Perfume Houses. 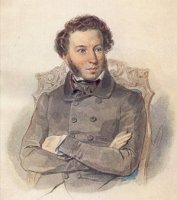 Note: image is Alexander Pushkin by P. Sokolov [1836; cropped] via Wikimedia Commons. The bottles are very nice to touch and hold, in fact! This sounds like just the thing to keep me engaged with War and Peace now that I’m thousands of pages in and not even a third of the way through. But given the price, I think I’ll have to get my soft leather fix from Bottega Veneta instead. Oh, which translation are you reading?? I just finished Anna Karenin and have been considering ‘War and Peace’ but honestly I am intimidated by its length! A.K was my first Tolstoy, though I have read some Dostoevsky. Neither author is light entertainment, but the Dostoevsky I’v read seems to have left much more of a mark on me than any other work. Ok, so if I ever work up the courage I’ll know who to look for! Love both Dr. Zhivago and especially Anna Karenina, but haven’t tackled anything heftier than that. Crime and Punishment tut-tuts at me from the bookshelf every so often, but I haven’t the patience or mental capacity these days, so it can just glare at me until life settles down a bit. I’m on a sample-buying freeze, but it sounds like this should be one of the first on my list once I move out current inventory. I do love leather. I did read C & P, years and years ago… I think I used to read faster in my 20s!! Although Mr. LRose and I did recently watch a BBC adaptation (1980, with John Hurt!) of C & P, so that was like a refresher course. Kind of . I was with you until I saw the price. Errrp. No thanks. But this is a beautifully written review, thanks. Niche rarely comes cheap, right?! I actually love the “Bibliography” feature… but that’s the former grad-student in me speaking, perhaps. This sounds quite nice; I adore violets and resins and neroli in small doses. Despite your admonition, this might be the perfect scent to wear when I’m carrying. I’ll have to keep it in mind for those occasions, especially since I never found a JHAG to love. Jessica, lest you think I am crazier than I am (which is pretty darn crazy, actually!) I was assaulted several years ago in a grocery store parking lot…shoved in to the front seat of my truck as I putting my groceries in. He cut off my clothes with a machete, and had he not been fairly drunk, I doubt the story would have ended as well as it did. I feel like the playing field is a little more level for me now. I have a CCW, so I am all legal, and only carry when I’m out at night by myself! Joliefleurs, I am *so* sorry to hear that you’ve been through such an ordeal. I didn’t think you were crazy… I just thought you were joking. In your shoes, I’d probably be doing the same thing now! Based on your gutsy perfume choices, I’ve always had a feeling that you were NOT a woman to be trifled with, JolieFleurs – little did I know! I’ve tried Anima Dulcis from this line, and really love it. Can’t wait to try the others! Hi, KRL! The violet only lasts through the opening phase, but it’s beautiful while it’s present! Oooh I will have to try this, if just for the reference. I read Eugene Onegin about 6 years ago towards the end of college for my Russian Lit class and loved it. I got to smell most of the others in the line in Barneys when I was in Seattle in October, but sadly don’t live near one. I was chatting with the fantastic SA there so didn’t end up paying enough attention to what I was smelling from this line, though I do remember a couple of lovely orange blossom/neroli offerings. I was originally turned off by the name Arquiste and didn’t pay any attention when these were first announced. But Octavian’s reviews at 1000 Fragrances, Kevin’s, and now yours have moved this line to the top of my “to try” list. I think the last fragrance I was this eager to try was Via del Profumo Sharif, which I happen to be enjoying this evening. In fact, it’s an all leather day – I wore Le Dix to work this morning. There’s something both protective and bracing about certain leathers that is great for the part of winter that feels like early spring. did you read Onegin in Russian or in English? there is a popular saying in Russia, “Pushkin is our everything”, i think it’s a quote from a famous literary critic. i love the concept of a fragrance tribute, i think that great fragrance, like great music, has capacity of translating life into notes. and for some reason i feel really mesmerized by the bottle… Aleksandr definitely sounds worth a sniff! I too love the concept. What about Beethoven, Proust, Chopin, Satie, Brontë or even Picasso? Possibilities are endless. As a painter, I could envision translating their essence into art. which Brontё? I don’t know, the thought of a whole line inspired by many great names in culture doesn’t really feel appealing to me. It’s wonderful if this one fragrance is inspired by the true interest in or love for Pushkin’s poetry, but turning personal experience into a “winning concept” by exploiting this idea feels wrong somehow. also Pushkin is not really that well-known, i guess that’s what partly makes it romantic and takes the commercial “edge” off. I’m thinking Emily. Wuthering Heights. It has remained my all time favourite ever since I read it as a 12-year old. I first read the Japanese translation and then in English. nice i think Wuthering Heights is a very unusual story, even though i’m not sure if i really like it. but i really got interested in Emily when i read a bit of her poetry. anyway, there is definitely something about her that could translate into an interesting fragrance. Dilana; I would add wet stones and old books to that. LM, I, too, like the idea of perfumes inspired by other works of art. Luca Turin memorably compares perfumes to music or art, for example, Chanel No. 5 to a Brancusi sculpture, Apres L’Ondee to Debussy, something else to Satie. Art should work as an inspiration, too. I like the Chanel No.5 to Brancusi comparison. I think perfume invokes a visceral reaction as do art and music and I’d like to see perfume inspired by a great work of art or a great artist/art movement. That Brancusi / no. 5 comparison is one of my favorite lines in the whole Guide! Trollet, I read the whole thing in English, and excerpts in Russian (as well as some shorter famous poems, like “The Bronze Horseman” and “I loved you…”)… but that was a long time ago! I need to revisit his work, in English, at least! oh, i’m impressed! i hope the translations do him justice. i was thinking about re-reading some of his works myself, they’re really worth it. it’s always intrigued me how verses can be enclosed in such a “light” and exquisite word frame that they seem simple while the thought they’re conveying may in fact be very complex. his poetry is truly unique, hope this fragrance is, too! and thanks for the poetic review. That was an amazing review and now I really want a sniff! I’m not sure about literary/cultural references grafted onto perfumes, as I just don’t know enough perfumes! The one literary reference I love is ‘Let me Play the Lion’ – but – I haven’t had a chance to smell the frag so I don’t know how relevant it is. Literary references haphazardly grafted (as you so well put it) can really annoy me though. Especially when its a text I know and deeply love that is randomly exploited to give extra credit to a far less valuable work. A less valuable work can use such references, of course, if they somehow connect to its blood – but if they don’t , I GET MAD. The idea of dedicating a fragrance to a place, a time or a person is very nice and I can how a fragrance dedicated to a famous poet, composer or novelist can enhance the atmosphere while reading the novel or listening to the composition. Now where did “visualize”go? I can visualize how the fragrance will enhance the artistic experience etc etc. Sorry for that. I would have loved a Scarlett O’Hara perfume when I was 16, too! I’m usually irritated when brands slap the name of an author or literary character onto the bottle (remember Tocca’s Colette? how silly! )… but in this case, I liked the result. Maybe because the description is well-written and well-edited, maybe because the fragrance thoughtfully evokes a whole narrative (rather than just “Pushkin’s genius!” or whatever), maybe because I happen to like the notes involved (and the end result is good quality).